iShares Russell 1000 Value Index (IWD) – large capitalization value stocks. iShares Russell 1000 Growth Index (IWF) – large capitalization growth stocks. iShares Russell Midcap Value Index (IWS) – mid-capitalization value stocks. iShares Russell Midcap Growth Index (IWP) – mid-capitalization growth stocks. iShares Russell 2000 Value Index (IWN) – small capitalization value stocks. iShares Russell 2000 Growth Index (IWO) – small capitalization growth stocks. 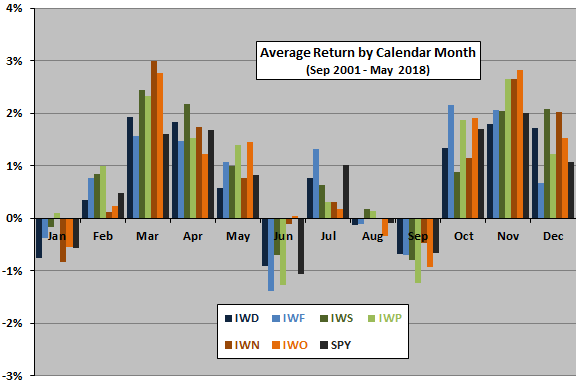 The following chart shows average (equally weighted aggregate) style performance and dispersion of style performances by calendar month over the sample period. Overall, spring and fall are stronger than late winter and summer months over the available sample period. Style returns are generally similar by month, with the largest dispersions in March, June, October and December. Small dispersions suggest little opportunity to identify clear calendar-based style preferences. For greater detail, we look at a breakdown by style. Value beats growth in March, April and December. Growth beats value in October and November. Large capitalization underperforms in several months, but outperforms in July and October. 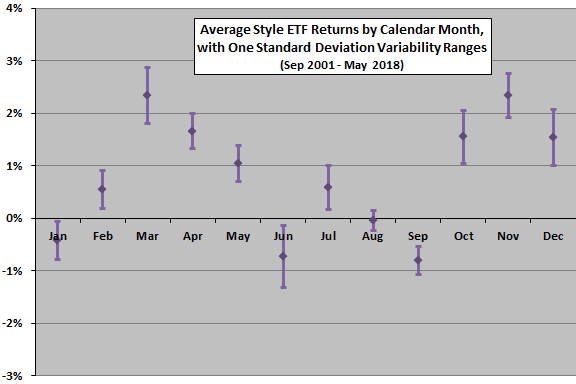 However, the sample period is too short (about 17 years) and performance differences among style ETFs by calendar month generally too small for confident inference. For another perspective, the following table lists the winning and losing style ETFs by calendar month. In summary, evidence from limited data suggests the possibility of some systematic differences in seasonality among size and value/growth ETFs, but the combination of small sample size and modest magnitude of differences limits confidence. As noted, the sample period is very short for reliable inference about annual cycles. The iShares style definitions may not be concentrated enough to exploit style peculiarities identified in some research. See also “Sector Performance by Calendar Month”.